Mercy Me is the name of a contemporary Christian worship band. Usually I'm old-fashioned in my musical tastes but I like a lot of their work. The words Mercy Me took on a whole new meaning a few minutes ago. Traveling south on Hwy. 19 here in Florida I thought I was "going with the flow" of traffic but a Sheriff's cruiser pulled up behind me with his lights flashing. I pulled into the right lane, thinking he wanted to pass me. No such chance! He pulled me over. 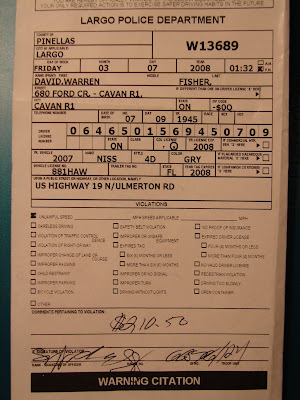 After giving him my driver's license and rental car agreement I waited for what seemed like an eternity for the policeman to come back, quietly praying that he would have mercy on this pilgrim from Canada. Finally he approached my car with the "ticket". He told me that he didn't want to spoil the last day of my trip with a $210.50 fine and handed me the "warning citation", not a ticket. Whew! Was I relieved! The officer showed mercy when I didn't deserve it. I WAS speeding even though I didn't realize it at the time. The penalty should have been meted out but mercy was extended instead. You know where I'm going with this don't you. We all deserved to be punished for our sins "but God who is rich in mercy" stepped in through His Son and declared us righteous and justified...in Him. God showed mercy! The officer was merciful. I'm grateful! Now - how can I extend mercy to someone else today? Those kind of things are wonderful when they happen, and blessings upon that policeman for the mercy he showed to you, and I pray you have the chance to pass it on.